The alternative film screening programme Nasi Bungkus Cinema, hosted by the School of Arts and Social Sciences,returns on Thursday, 11 April 2019 at 5.30pm-8.00pm at the Plenary Theatre. A young woman who lives with her strict father aspires to become a champion at the popular martial art sport silat. 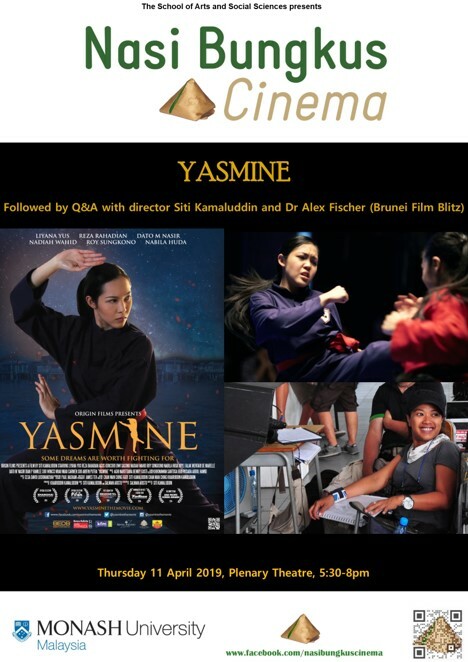 Yasmine is the film debut of Brunei’s first female director Siti Kamaluddin, and the first feature-length commercial film ever to emerge out of Brunei. This engaging coming-of-age story explores traditional gender roles, teenage rebellion and inter-generational struggle, as the protagonist Yasmine (played by Liyana Yus) pushes the boundaries to achieve her dreams within the middle class family setting. For more information please see the Nasi Bungkus Cinema Facebook page: http://www.facebook.com/nasibungkuscinema. Alternatively, you can email Dr Ana Grgic (ana.grgic@monash.edu). Authorised by: Marketing and Future Students. Maintained by: Monash University Malaysia Webmaster Team. Last updated: 27 Jan 2019.